Nebraska 150 Reading Challenge Items Available Now at CC Public Library! Looking for Ideas for Your Garden? We Have LOTS of Gardening Books! It’s always interesting to see how different they can be! Save a Turkey… Feast on Books! 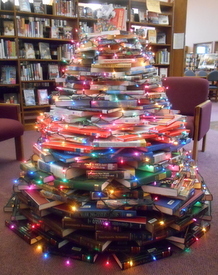 Be sure to stop by and see our Christmas Book Tree! It is definitely taller than the past two year’s trees! One of Nebraska’s top ten wildflower viewing roadways is located nearby: HWY 2 from Grand Island to Alliance. Nebraska Wildflower Week is coming up May 30-June 8.